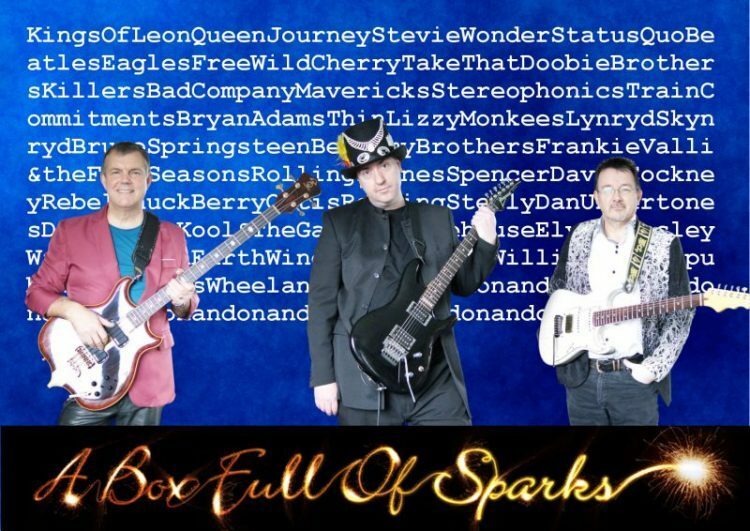 A Box Full Of Sparks are a highly sought-after trio of professional musicians. We have been wowing audiences with our carefully designed two-hour classic rock, pop and soul show – a supreme entertainment experience to ignite special events, weddings, corporate events, graduations and promenade balls and any high-profile function. But don’t just take our word for it… go and see what Newly Weds, Corporate Event organisers and even Clubland are saying about us. Just click on the ‘Testimonials’ tab at the top of this page and follow the ‘Kind Words’ links. As highly experienced professional musicians, we have performed our classic contemporary music show at event venues across the UK and Europe. We provide high-energy entertainment and dance focussed hits of the 60s, 70s, 80s, 90s, ‘noughties’ and today. Professional lighting and special stage effects are combined to provide an outstanding visual and sonic experience. We guarantee superb musicianship, dual harmony lead guitar breaks, rip-roaring guitar solos and sparkling vocal harmonies. …dancing, singing and playing air guitar!